This morning I have been thinking about Neil Armstrong and his famous quote, “One small step for man, one giant leap for mankind.” Supplemental Location for 9-1-1 might come a bit short of walking on the moon, but it is a major advancement for our public safety industry. On Monday, September 17, 2018, Commercial Supplemental Location officially launched in the North Central Texas Council of Governments 9-1-1 (NCTCOG 9-1-1) region on Apple phones that have installed iOS 12. Today, Google announced that Android phones will also provide supplemental location. I started my career in 9-1-1 prior to wireless phones. As a public educator, I was able to honestly inform the public we could find them when they called 9-1-1, even if they could not speak or tell us where they were. While wireless phones revolutionized our personal lives, they took 9-1-1 accuracy backwards. Although public expectation that 9-1-1 can pinpoint a caller’s location has not changed, 9-1-1 educators were no longer able to make that promise to our citizens. About 90% of NCTCOG’s 9-1-1 calls are from wireless devices. Our legacy location technology uses network triangulation of towers, or more recently, trilateration. 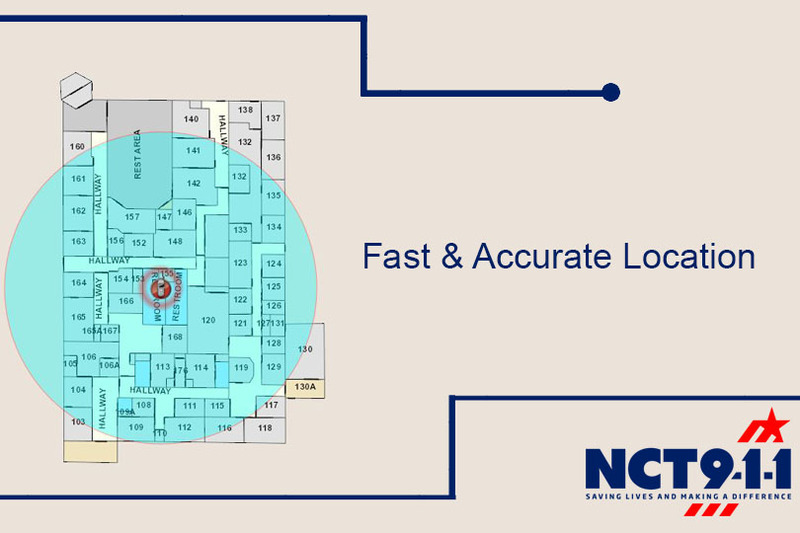 This allows a telecommunicator to see an approximate location of an emergency. While they can probably get fire-fighters close enough to see the smoke, they are challenged to pinpoint the location well enough to send law enforcement or EMS to indoor events, especially in an urban area. This is why we answer the phone, “9-1-1, where is your emergency?” Unfortunately, medical conditions, stress, domestic violence and active shooters are just a few examples where the caller cannot provide his or her location. Telecommunicators and first responders have been frustrated with the inability to locate wireless callers for years. Anything is better than nothing and I am so thankful that the wireless carriers, the FCC and national 9-1-1 associations have been working to improve location accuracy over the last several years. I want to give special thanks to RapidSOS, who introduced hope for our location challenges when we first met over four years ago. They had a plan and believed they could create the technology, but they were looking for partners in public safety to tell them what telecommunicators wanted and needed. They worked with our PSAPs and numerous others over the years. RapidSOS started this as an application (Beacon) and heard the public safety cry that we needed ubiquitous coverage, so they began working with the device providers. They continued to work with public safety and have gained credibility throughout this journey. Which brings me to thank our wonderful telecommunicators, supervisors and PSAP administrators who have supported us in these efforts of improvement. Many of you participated in feedback, focus groups, training, testing, pilot projects and press coverage. You have opened your doors to NCTCOG and RapidSOS and done all that has been asked. I am also appreciative to the members of NCTCOG 9-1-1 staff who have added to their regular responsibilities to work on this project and achieve this goal. They did it because they have a passion for 9-1-1 and they believe we can make the service better. You all have been a part of something great!